Why choosing custom WordPress over a theme is really important? There is no doubt about the fact that WordPress is the best ever CMS all around the world where millions of users create websites by using the WordPress Themes. The best thing about WordPress is that it comes with so many WordPress themes that can be used to create websites for various niches. But, the best part is that there is custom WordPress development which can be used to create branded websites across the world. WordPress is such a Content Management System (CMS) that is really beginner-friendly and all its settings can be modified according to the needs of the website owner. In some cases, your beautiful WordPress theme will help you create an ideal brand website for your business. The goal of website owners and WordPress users is to create such a website that can give amazing user-experience to the users. This also gives an amazing opportunity to create a personalised website with all the elements that are necessary to impress the website users. After all, custom WordPress is made to impress the users of the website by creating a great website. An appealing website with all the features that are unique and never seen before will always be able to attract the traffic as well as retain the traffic. Why take the aid of Custom WordPress development for your website? As we already said that a custom WordPress website is the best solution to any website needs and requirements. WordPress web development is already very popular because of the fact that a WordPress website always looks dynamic and robust. Moreover, the websites created with WordPress are really fast and responsive which helps to grasp wider audience across the world using various devices and gadgets. Here’s how to create a unique and new website with personalisation? A website should have a very clear goal to attract a certain kind of audience and then retain them with further features which are accessible to the exclusive users of the website for sure. This is the true meaning of all branded websites: effectively attracting visitors and creating a potential sentiment to inspire them to take action for the future. If you are still confused at what is a branded website then we can say that a branded personalised website is the one which shows in first look that it is the website related to a particular niche and not just any website. What happens is that when we use a WordPress theme which is in the directory of the website and a custom WordPress Developer is not hired for the same, then the website will not look like a branded website but a common website with no special features and plugins or customized designs. The theme of the WordPress brand may be overwhelming at first, but you can do it. By splitting the design process into multiple components, you can create the style of the site you need and effectively project the brand. Of course, the first step in this process is to determine the brands you want to create. The first thing to do is an important decision: Do you want to share upscale, fun, practical, modern and powerful branded website? Often, most brands belong to one or more of these top-level categories. ● Who is my client? ● What is the brand requirement? If your answer is this: If my client is looking for a professional white collar solution, turn it into a high-end branding approach. If you have an answer: I would be able to create a deep emotional connection with a powerful brand, I would like to choose light-weight theme and then modify and edit it according to the needs of the client and feel the capabilities of the customer. If you get the answer: Create a custom WordPress website using cheap widgets and adopt a simple and practical brand image. One has the chance to explore the favorite websites and take the time to discern them. When browsing different websites, imagine them as themes and insert different images and unique content for each one of them. ● Full control on font and color. Images are a great way to customize WordPress themes. A consistent style of selected images plays a major role in the development of custom branded websites. Therefore, custom WordPress website development is the way to go. The custom illustrations above used in WPMUDEV can make a big difference when converting a WordPress theme to a custom branded website. WordPress is a very flexible CMS that is able to offer its users the way they want to get their website created with all the personalised and branded in all respects. Why it is Important to Hire Professionals for PSD Design to WordPress Conversion? WordPress CMS is the market leader in developing websites on internet. WordPress has made it easy to create and manage websites. Due to huge benefits of WordPress the demand for PSD to WordPress conversion has been rising very rapidly. When we talk about the transformation of the PSD file to WordPress, we have to discuss PSD to HTML conversion also as it is the important step which needs to be completed carefully. Now a days PSD to WordPress conversion has become one of the main reason for the success of a website. In this process, before starting the development work, a standard website design is prepared in Photoshop in form of PSD file. After all the desired and needful changes and customization, that design is converted into a WordPress theme to bring out an amazing WordPress site. As it is the end task before you get the final website therefore it holds high importance in website development market. There are so many web development companies which are ready to convert your PSD designs into HTML/CSS and ultimately into WordPress theme. That’s why today there is a huge demand for PSD to WordPress conversion services in the web development market. If you are ready to convert your PSD files into WordPress, then you have to start from somewhere. If you don’t know from where then read on. We have seen many people who want to convert their PSD files into WordPress and start learning themselves to accomplish to whole process. They watch many YouTube tutorials hoping it will help them to learn how to convert PSD files to a WordPress theme. But the truth is that most of these how to guides and tutorials only tell you about the basics and don’t tell you about the practical aspects of this whole process. Hence what you will learn online may not help you much in carrying out the PSD to WordPress conversion process. That’s why the role of professionals become very important as only they can do what you want to do. Now we will discuss about the main reasons why you should always hire professional to do PSD to WordPress conversion. Only a professional with deep knowledge of working in WordPress CMS can help you to convert any PSD files to a perfect theme for your website. The reason behind this is that a PSD to WordPress developer knows the fundamentals such as hooks, tags, filter and template hierarchy and they also know WordPress functions and its architecture. Moreover, they know coding in PHP therefore they can write clean code for your custom theme quickly, efficiently and effectively. All of the WordPress theme which are created from PSD files have to be validated and tested for cross and multi browser compatibility. This work requires high level of technical knowledge of the WordPress framework, solid understanding of HTML and CSS and also the knowledge of how search engine works. If you hire a professional developer for this job, then he will even do the optimization of your WordPress theme for performance and speed. Hence you should always hire a reliable and experienced team who can do PSD to WordPress conversion and also do testing and optimization work. 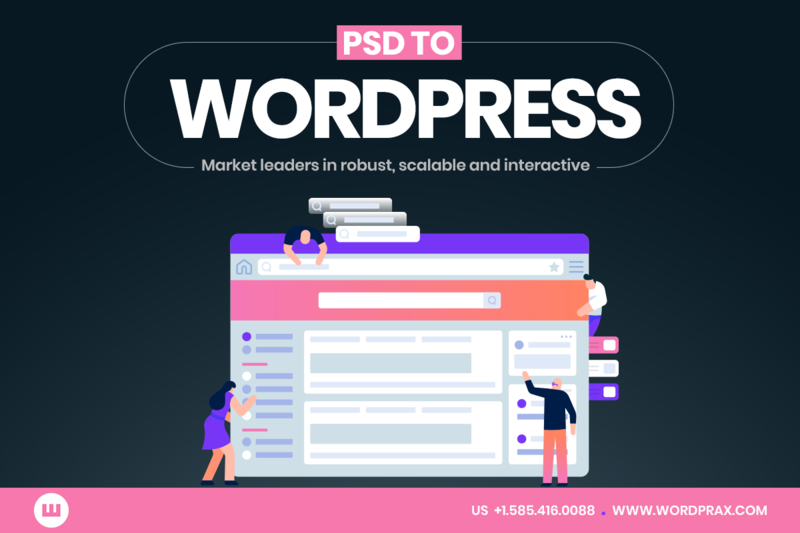 The conclusion is that you should not waste your time watching YouTube tutorials and reading documents in the hope that you will become master of how to convert a PSD design to WordPress theme. Rather you should quickly hire a professional and expert PSD to HTML and PSD to WordPress developer for your website building project. We have discussed all the important aspects and reasons for hiring professional WordPress developer above like a professional has the right kind of technical knowledge and experience to convert PSD files into a clean, SEO friendly, responsive and user friendly WordPress theme. Hence now it’s your turn to take your final decision by hiring a professional developer and build a successful WordPress website for your business. What points to consider in the process of WordPress theme development? As WordPress evolves successfully into an undeniably extraordinary CMS and an ever increasing number of developers becoming dependent on this CMS for their living, there are more and more better ways that seem to come out in the sphere of WordPress Theme Development, so we are here discussing about the best ways you can develop WordPress themes for your client website. What we are extremely inspired by is the present popularity of WordPress: how a normal developer who is a newbie in his field deals with the deployment of their sites which is a part of WordPress theme development as well, and how might we enhance the techniques to lend a helping hand in this process! In a survey conducted by a famous organisation- we had some amazing results! We are going to mention those results so that is known clearly that what all methods are much preferred by the WordPress developers around the world? So, a total of 327 proficient WordPress developers were included in the survey in which they all maintain 6,378.5 WordPress websites in a combined manner. OUt of these developers who participated in this survey are actually handling small number of websites,only 10 are being maintained by these WordPress developers. 8% of the all developers managed between 30-40 websites. There was a biggest shocking fact in the survey that was conducted. It was that a person was even responsible for handling 700 websites in one go. Woah! Now, we can truly say that a large number of developers from across the world handle WordPress websites with WordPress theme development services catered out to the businesses for flexible website development and maintenance. Coming to the techniques that would help the developers to easily manage theme customization as well as deployment much easier and better. After all, there is always a room for improvement. There is no doubt about the fact that GitHub is the most popular platform for alI the FAQs that a developer of WordPress might have for their clients. 41% of the developers utilize Git for their development and customization endeavours. When we talk about the tips to refine the WordPress theme development processes, one major thing that hits our mind is definitely the use of visual editor to create dynamic themes. WordPress developers must use this tool to create client websites that really look super refined as well as it becomes easier for them to complete WordPress websites in a much lesser time as well as much better output is created. But, there is a catch…. One can’t get access to good things so easily. Why we are saying this? The reason is that there are around 1.6k themes in the open-source WordPress directory and only 200 themes seem to have editor style. We have a solution! You can add editor style to your chosen WordPress theme. It’s not at all complex to do the same. What you have to do is just to call add_editor_style query during the time when the theme is being set up. Obviously, if you have enough knowledge about website development, you would know that it is done in functions.php file. Of course, the whole hassle of writing the CSS is saved as almost all the code has to be copy pasted from the original stylesheet. Why should you must try on this is because the WordPress themes which has editor style look are very much greater because of better and refined coding as well as saves a lot of time and hassle. Aligning the content as well as the images for easy publishing on the websites, becomes so much easier than ever. The shocking fact was that 45% of the developers don’t even use version-control software which is obviously not a good thing as far as WordPress theme development is concerned. This was even more unfortunate to know that these were the most Professional WordPress Developers and designers working for the clients across the world. Why choose WordPress as a successful CMS for websites? WordPress has seen a lot and how? It took its flight off with being just a simple platform for the bloggers which acted as a blog publishing platform. It had all the essential features which were most needed by the bloggers to run their blog. Never had anyone would have thought that WordPress development would be so popular after just 15 years of its birth in the web development world. Custom WordPress development is the backbone of websites of over 28% websites being run on internet today. Isn’t that an amazing fact about WordPress development? Working on WordPress is based on MySQL and PHP, however working on WordPress and creating a simple blog on WordPress is no big deal for the programmers also! A web hosting service is needed to make a custom WordPress website go live on the server though. But you have a free version of WordPress.com which lets the users create a blog without paying a dime. ● The awesome websites created with custom WordPress development are SEO-friendly as well as very much user-friendly. ● The beginners as well as non-techies find it very easy and convenient to create their blog as well as a simple yet modern and clean website in just a few taps and clicks. ● We see a lot of creative bloggers create WordPress blogs related to their niches using the free themes available on WordPress.com. ● However if you are looking to convert that free version of WordPress blog to a branded exclusive website with WordPress development, then hiring a professional WordPress developer is always an amazing option at hand for you! ● Even if you have an old-looking website in static HTML, getting it converted into an all-awesome WordPress websites. ● If the WordPress developer you choose to hire is an expert, you can easily expect an extraordinary-looking website with WordPress as the CMS. ● The freedom to create custom WordPress themes with this CMS knows no limits and boundaries. A developer can also create themes using this platform and sell those themes for many bucks. ● The resources available on internet to learn about WordPress and the features of WordPress are many. By utilising these tools and new plugins on WordPress, a beginner can become an expert very fast. To add to the already mentioned benefits, let’s not forget that it’s very easy to edit and modify the WordPress website with a browser. Because of the fact that WordPress is very flexible and versatile medium to create websites with much ease. Scalability of WordPress is not an issue at all. At any time when you think that you need to expand your website along with your business and requirements, it will never fail you there too. This is the reason why WordPress is so popular among the beginners as well as the experts at any level. The freedom that custom WordPress development gives is beyond imagination.